I was approached by a newly licensed massage therapist to help develop the logo for her business, and I jumped at the opportunity. Working with clients who are beginning their entrepreneurial journey, and helping them to develop their branding message from scratch lights me up. She already had her name in place – Powerful Nurturing, and knew how her logo should make her feel. We dove in with a series of conversations to help her hone in on the story of her business. What was it that she wanted to communicate about her business to the world? 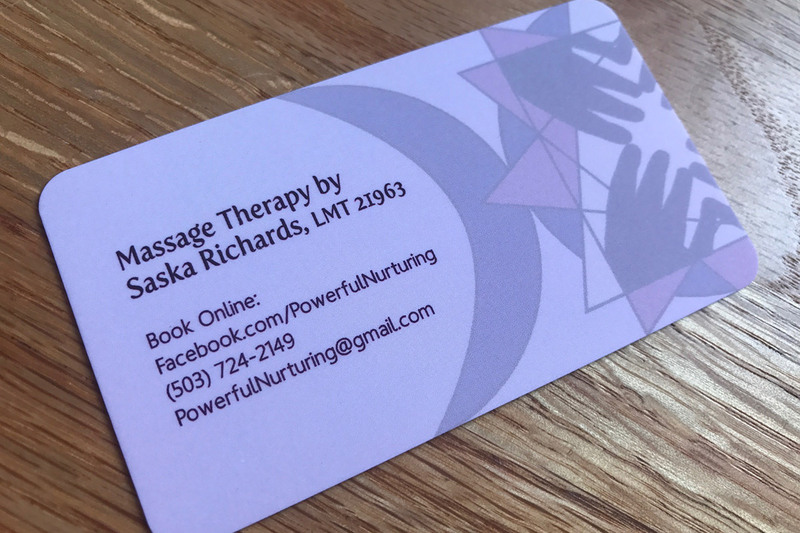 What sets her massage therapy business apart from others (aside from the fact that her hands are magical)? Answering these questions – and many others – allowed us to flow easily into a first round of designs. Finally, we were able to begin the design of her business card. 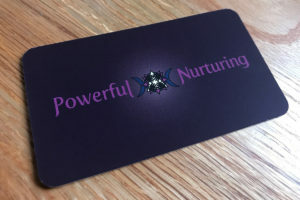 For me, a business card is not JUST a card. It’s yet another opportunity to tell the story of your business. In this case, we’re talking about a business that exists to make people feel gooooooooood. The card should reflect that. No sharp corners here! We went with a velvety matte card in deep colors that envelop the person receiving it…a harbinger of the massage that is to come.